Last October I focused on the rare case when the price of palladium, for the first time in many years, could surpass the usually dominant platinum price. Both, common sense and chart analysis of the palladium price suggested that the triumph of this metal could be temporary. In the charts below, we can see if this conclusion turned out to be right. Sixteen years ago was the last time that platinum was cheaper than palladium in 2001 (black vertical line). By then palladium had spent a year in the dominant position over platinum, and at that time the price of both metals had been fluctuating around $600 level. 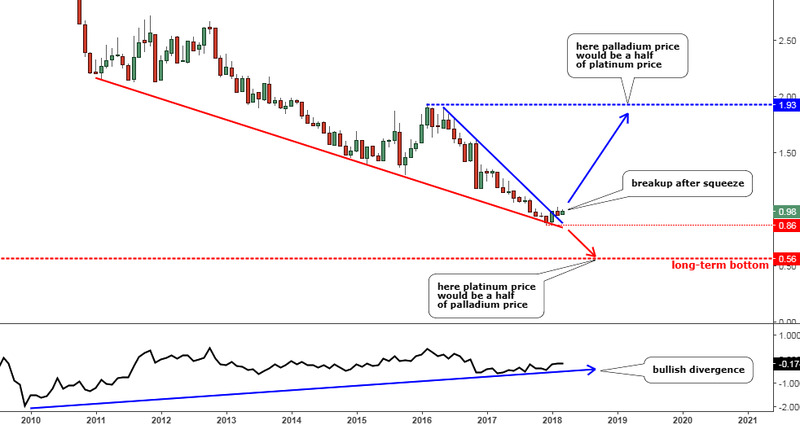 Since then platinum has returned to its usual upper position to palladium, and the gap was growing exponentially in favor of platinum until it reached the peak with the $1600 of supremacy in 2008. After that, the gap began to narrow and last month it entirely evaporated as a global shift in the automotive industry showed a growing demand for gasoline and hybrid cars (palladium related) amid slowing demand for diesel cars (platinum related).